"I have enjoyed every moment of the time I have had the privilege to serve as president of my alma mater." 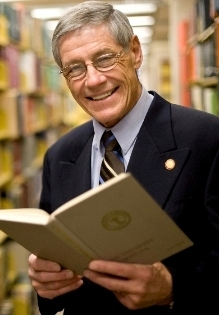 Dennison came to Montana from Kalamazoo, Michigan, where he served as the Provost and Vice President for Academic Affairs of Western Michigan University (1987-90). In earlier years, he spent time at the Universities of Arkansas and Washington prior to 18 years at Colorado State University in Fort Collins. At Colorado State, he started as a history professor and then served in numerous other positions. He held simultaneously the positions as Associate Dean of the College of Arts, Humanities, and Social Sciences and Associate Dean of the Graduate School for International Development Studies. He also served as Acting Academic Vice President, Associate Academic Vice President, and Director of Admissions and Records. After more than 40 years of service as a University executive and administrator, President Dennison returns to his roots as an historian, researching and writing the history of The University of Montana. He will also continue his "research" on the perfect round of golf. In May 2012, the University Theatre was renamed the George and Jane Dennison Theatre, in recognition of the Dennisons' contributions to the University. Reaccreditation of Pharmacy Program - the new College of Health Professions and Biomedical Sciences housing theSchool of Pharmacy which emerged as a leading research center on campus and ranked 7th nationally among Schools of Pharmacy for attracting NIH research funding.